Lingering glances may not always be due to attraction, say scientists. According to a study, prolonged gazes may mean you are the subject of nasty gossip. Unconsciously paying more attention to those who have been spoken poorly of is believed to have arisen from evolution. Gossip began by allowing people to learn about individuals without having direct experience. It also made people aware of who to avoid and who to keep their eye on. The volunteers in the experiment, led by researchers at Northeastern University in Boston, were shown pictures of different individuals which were associated with positive, negative or neutral gossip about the subject in the photo. All the faces in the photos were similar so that no certain features could be claimed as drawing a volunteer’s attention instead. The researchers found that the volunteers stared longer at those images associated with the negative gossip. 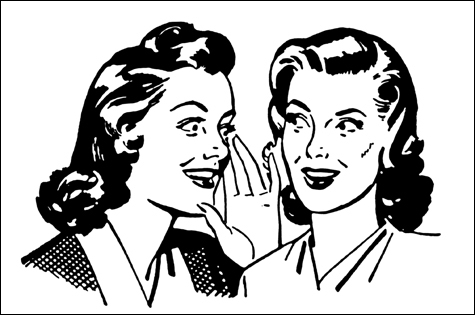 “Gossip is a vital thread in human social interaction, ” the researchers said. “As a type of instructed learning, gossip is a way to learn socially relevant information about other people’s character or personality without having to directly experience their triumphs and misadventures. “Whether delicious or destructive, gossip is functional. It provides human beings with information about others in the absence of direct experience, allowing us to live in very large groups.